I created this place for some of Lady Euphoria Deathwatch’s stories to reside. In August of 2008 I started to go to a writer’s workshop. I had been writing stories for my own amusement for years and I’d been blogging since the May before. I was ready to take the next step. I wanted feed back for my fiction. As the classes progressed I challenged myself to write using different styles of writing and using different types of story categories I hadn‘t really used before. When I wrote a piece in the Horror group my life changed. Kissed by this muse I have been writing short stories in this vein since then. If you are looking for blood and gore just for shock value, please look elsewhere. You’ll not find it here. That said, they are not all devoid of blood completely. Blood, death, ghosts, and odd happenings do have a place here. Feel free to add your two cents, inform me of needed corrections, or let me know what you thought about any of my stories. Any comment is appreciated. Did you feel a Shiver or a Thrill? It came to the apartment in an envelope. The regular, white, business size envelopes that most mail comes in. His name, John Jones, and address were on the front. At first he thought it was junk mail. The return address was just an address with no name or heading to clue him in as to the sender. He was going to throw it away unopened… but stopped himself at the last minute and tossed it on his desk. He would get to it later. His friends were coming over any minute now to watch the game. He found it again days later as he straightened his desk. He thought about throwing it away again. But he was now a bit curious. It might be an ad for something he did want to buy but at a discount. Or it might be a coupon that could save him some money so he could use the savings towards a night out with his friends. It had been a while. The new job wasn’t paying as well as he had hoped for just yet. And it was also cutting into time with his friends. John looked closer at the envelope. It was addressed in blue ink. Hand written, not that printed stuff made to look like a personal letter. He thought about putting the return address into a Google search on his computer and seeing what was there… but the phone rang and he was, for the moment, distracted. It was now the weekend again. His friends were over to watch the game and hang out. Tom grabbed the envelope to use as a coaster under his beer. Tom was always doing things like that. They all blamed Tom’s mother for his oddly tidy behavior. She was a neat freak. After his friends left John thought about the good time they had just had together. It wasn’t a big memory but a good one. The kind you want to look back on when you are old. Comfort, fun and friends together. Days later, when he couldn’t stand the smell of old stale beer and dried up pizza boxes any longer John decided to clean the place up. He found the envelope again by accident. It had fallen to the floor and had stuck to the bottom of his shoe while he was cleaning. As he peeling it off his sneaker it tore open and the papers inside tumbled out. The first was just a sheet of white typing paper. Nothing at all on it. It was wrapped around a small card probably to keep others from reading the card through the envelope itself. He picked up the business sized card and turned it over to read it. ‘Prepare for a visit from Death’ it read in large letters across the top. ‘If you are reading this card you will died quite soon.’ printed medium block letters said. John tossed it all out with the rest of the trash and dumped some stale beer on top of it for good measure. Whoever sent it was a jerk. Someone was talking to him. John tried to wake up and answer, but he was still too heavy from sleep. He just lay there not moving, just listening and waiting for either waking or sleep to take over once again, he didn’t care which. From the next room another voice said, “Lieutenant, I found one of those business sized cards in the trash. Beer soaked from the look of it and the ink was all running. Hard to make out all the words. But it was a definite threat. I bagged it with the envelope and put it in the evidence box. Interesting thing thou… The return address is for the city morgue.” The Sergeant’s voice finished as he entered the bed room where the lieutenant stood over the body on the floor, waiting. The Lieutenant looked up and said, “Are you okay there Sergeant? You don’t look too good!” Louder he called out, “Get those Ambulance people back in here! I think he’s having a heart attack!” as the Sergeant crumpled to the floor clutching his chest. John woke up again to a new voice. The man reached down towards John and was straightening John’s clothing. The man stepped back to admire his work. He reached up and over to John’s head. “I‘ll just close your eyes now. We don’t want to frighten your guests tomorrow. Funerals are such fun. Well, fun for me anyway. You’re a bit stiff.” And he laughed at his own joke. And the man closed the casket lid leaving John to ponder his fate alone in the dark. Raven had been around the florist shop for longer than she could remember. It was Gran and Pops shop then. Her parents took it over when Raven was in second grade after grandpa died and grandma wasn‘t doing as well in the shop by herself. Every day after school, Raven did her homework in the back room while Grandma talked to herself and made up the orders. Mama was at the front counter working with the customers. Dad was at his self named ‘real job’ at the office. He also called himself a silent partner of the florist shop but he was not so silent every Saturday when he did the bookkeeping there. Just to set the record straight, Raven wasn’t the name given to her by her parents, but a chosen name that seemed to fit her well when looking at her long black hair. So Raven was what everyone called her even her parents and teachers. Raven was also a perky Goth. Happy enough to be accepted by the community at large, but still a mystery to them in her black clothing, pale face and black painted lips and nails who spent her down time visiting the cemetery. So when she started to work at the florist shop after school and weekends, after her mother grew ill, a few regular customers took their business to the other shop in town. But Raven had the knack for ordering just the right amount of the right kinds of flowers just like her grandparents did, especially for unforeseen funerals. So the business was doing well despite a Goth behind the counter. The shop was becoming well known for having just what you needed when the time came to order an unexpected flower arrangement. So when her mother was doing better enough to come back to work after her operation she kept Raven on as a part time employee. Grandma didn’t need to work at all after that and she would only show up at the shop when they were busy with a large number of orders. Whether by the grapevine or some unknown force Raven’s mother never did admit to knowing how, because Gran wasn’t called in, she’d just arrive in time to help. On rare occasions Gran would say something about grandpa telling her about a death, but Mama put it down to old age and Gran’s missing Pops. Raven and Gran’s favorite arrangements were the funeral orders. They both liked the calla lilies best. And people didn’t use them much for anything but funerals these days. The trend in town was that funeral sprays had mostly white flowers. Sometimes a favorite color would dominate. But they didn’t vary much. Casket spreads, sprays in paperboard vases, and those dreaded house plants to show the family left behind that life did go on, or that the giver didn’t want the dying cut flowers reminding them of the death itself, as if a houseplant made all the difference. And the few penny pinchers who didn’t want to see their money die in the vase. Gran would just shake her head and Raven would smile back at her. They didn’t need words between them most of the time. One day Raven heard Pops voice loud and clear telling her to change the standard weekly order before the invoice when out. Five times as many flowers as usual. She looked around but the bell hadn’t rung and no one had come into the shop. Her mother was still out buying more of a special ribbon for a wedding order to replace a spool that gotten wet. Raven ordered the flowers anyway sealing the envelop and placing it with the rest of the out going mail. She felt sure it was the right thing to do even if it sounded so strange to be taking orders from the dead... And for mostly her school colors too? Next week was Halloween that usually meant more autumn colors. Maybe there was a school function coming up that needed them and she had just forgot about it. The letter carrier came in without a word and took the out going mail leaving the incoming bills on the counter for her mother to go through when she got back. Raven finished her homework before the next customer came in and interrupted her again. The rest of the day was spent filling the wedding order and calling the person hired for the day to deliver them to the church, reception hall, and house. The next week was a busy one for everyone at the florist shop. Raven had no school and that helped too. She wouldn’t be missing class to work on the gross amount of flowers going out of the shop. The football teams bus had been in a accident and two players killed, five went to the hospital, one critical. Flowers were coming and going as fast as their hands could make up the orders. Gran and Raven stayed late into the night to get the arrangements ready for delivery the next day. “He told you about the flowers, didn’t he?” Gran asked. “Pops? Yes, he did.” Was Raven’s reply, thou she couldn’t look at her grandma when she said it. Raven called in the order. She stopped by Gran’s house on the way home to tell her how much Raven loved her and to hug her one last time. “Have a good time at your Halloween party tonight.“ Was Gran’s parting words to Raven in this life. This taking orders from the dead was going to take some getting use to. But Gran and Pops would be around in spirit to help her out. 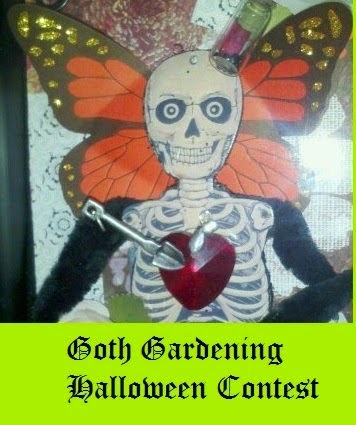 As requested by Gothic Gardener I have written a story for her contest about a shovel. I hope you like it. The shovel stood in the corner of a small room. It was not a new tool. In fact it was quite old and warn. But it was still quite strong and serviceable. A well kept working shovel. Oiled regularly to keep rust at bay. Kept indoors so neither harm or thievery should come its way. It stood waiting for work again. Many tools stood idle in the little village these days as fever swept through cottage after cottage. The shovel had been left there when the man it belonged to fell ill. And as with most good tools, work would come again. Slowly at first but soon back to strength. Days later, the man sat bent over the table eating his evening meal. The man was, thou not young, still quite strong. As with most folks he suffered little from the illness now that it was past. The lone candle on the table flickered for a moment and the fire in the fireplace breathed. An old tired cat uncurled from her place on the hearth rug. She looked at the man so obviously disturbed from her sleep that the man laughed. The cat slowly worked her way to the table top and ate what was left to her as the man made ready for his well earned rest. The man, a day worker who was well known to be very good with plants and his tenderness to the village’s children, worked the tough old patch of ground. He broke up the clumps of sod and weeds with his pick ax and went about prying out the larger stones with his pry bar. He placed the stones on the barrow to later add them to the back stone wall surrounding the chapel grounds on the other side of the lane from where his cottage stood. He looked up for a moment and saw Joseph Winston coming toward him at a goodly pace. “Not good ground for planting much, Jake.” Said Mr. Winston as he approached. Jake didn‘t look up from his work. “Still, it suits the propose.” was Jacob Mathers reply. “Lily or Rose?” Mr. Winston barked rather than asked with little interest. Jake nodded and continued to pry open a hole in the ground. “Well, see that you are smart about it.” was Mr. Winston’s parting remark. Old Thing came out of the dappled shade of the trees behind the cottage, shuffling through the autumn leaves collecting on the ground to sit by and watch Jake work. The cat made a face, yawned, and resumed watching. “This patch will get every bit of attention that I give the chapel patch if I have anything to do with it, even if it is smaller and less significant to the likes of him.” And Jake bent his back into his work as he shoveled out the earth to make room for the towns sweetest little flower. With his barrow full of stones Jake moved to place them on the wall and then he rolled his barrow and tools round and up to the chapel garden patch. There were no children playing about at the moment to give a small ride to on his barrow. The children were still sick he supposed. He sighed and looked for the parson so he could get on with his work. Jake would finish the patch on the far side of the wall later, once the day cooled again. Parson Alan Rankin was a dull and pompous old fool of a man. But with him came prestige and money so he was welcomed into the town and treated as a long standing member. Parson Rankin was overseeing Jake’s work by the chapel door path at the moment. Something he had never done before. “Could you make the line on the right a little straighter. The bishop is coming to the memorial.” The parson squeaked like a rusty hinge. No one slept through one of Rankin’s sermons. His voice kept all but the deafest parishioners awake. And the hearing kept the deaf awake to suffer along. The parson continued, “His Eminence is a relative of the deceased. Distant I believe, but still a relative. I must look up the family connections before he arrives. Don’t want to irritate a good man of such importance as the bishop by not knowing the facts.” He turned to go, but then turned back adding. “Nice straight lines.” again for a fourth time since he arrived. Jake was glad to see the parson’s back retreat into the chapel moments later. The soil here in the chapel grounds was well worked and soft in comparison with the patch by his little wooded cottage. Once he was through the sod his shovel did all the work. He moved the precious lily bulbs to the side to be restored to their places at a later time. It was harder work the deeper he dug, but not enough to need his other tools. Jake made quick work of it and moved back to the shade of the elm to finish his task there. The shovel stayed on the soil in the barrow until he needed the space for more stones. Jake carefully moved some of the good soil from the chapel grave site too the smaller hole and how dumped it to the side of the hole for use later. Roses need good soil and these roses were going to get it. Jake woke with a start. Old Thing was on his bed and nipping at his nose. “Hungry?” Jack said as he got up. “Today you will have to get your own meals. I’m busy and I have no time to cook. Even I will be having cold cheese and bread today. Out you go and catch some field mice.” He closed the door after the cat scampered outside. Dressing in his best suit of clothes Jake made his way to work. Normally he dressed in work clothes to fill the hole after the casket was placed in the grave. But today was a special day. He hurried on his way. Only one woman was at the graveside that morning. The body of a small child was wrapped in her best coverlet and shawl. Jake lay her carefully into the grave. The woman wept bitterly at the side of her only child’s final resting place. “Miss Lily, our Rose was the most beautiful child this town has ever seen. And so full of sunshine and goodness too. Everyone knew she wasn’t meant for a world as mean and mercenary as this one. The angels will take right good care of her now. Rose was special and belongs with them again.” Jake tried to sooth the woman with the only words he could think of. Lily spoke through her tears. “But she was nothing more than a harlot’s daughter. Not worth enough to be buried in the chapel yard.” Lily’s tears choked her voice away again. “My little Rose would like that. She loved the pale flowers best. I don’t know why you care so? She wasn‘t your daughter. Lord only knows who‘s but not your‘s.” Lilly shook her head to clear her thoughts and continued on. “Still, I thank you mightily for your part here.” She sat on the ground near by to wait as Jake finished dressing the little grave. She was still weak from being so deathly ill in the past week herself. Mr. Winston bumped arms with the parson to get his attention, “I see him coming round the chapel wall now. “Get him to his place!” Parson Rankin squeaked at Mr. Winston. Jake bent over the sweet light pink rose bush to water it well as the shovel came down on the back of his neck. His blood flowed onto the child’s grave as Jake’s heart bumped its last. Lily would often come to visit the little rose bush on the small outcast grave with the old cat. It has the most striking sweet roses for its blooms. Light pink, almost white and streaked with red like blood. Each beautiful petal shaped like the curved blade of Jake’s shovel. Jessica was working in her sparkling clean kitchen. A kitchen that was equipped like a lab in it’s efficiency. She was watching the canner out of the corner of her eye while she was cutting up the fresh meat her husband had managed to hunt down on his weekend hunting trip. Food was getting harder and harder to acquire in these hard economic times. And what there was of it in the stores was being priced out of their income range. Jessica believed that the over chemicalized sinthameat wasn’t good enough for her children anyway. Aaron and Jessica weren’t going to just let their children starve. So Jessica had put in a vegetable garden in the back yard and Aaron went on weekend hunting and fishing trips to augment their money situation. The garden wasn’t just for food for the family it also attracted smaller animals that they trapped and used as bait. The kids were in one of the bedrooms playing while Jessica cut the meat off the bones. This would be many pints of stew before she was done with it. They would be put away for leaner times when the hunting wasn’t as good. The radio was keeping her company. Aaron came into the kitchen and kissed her on the cheek. His beard tickled her a little on the neck and she laughed. “Good to hear you laugh, Love.” he said to her. He laughed and she threw a dish cloth at him. He ducked and came at her grabbing her around the waist and kissing her full on the lips. “I’m just happy that the college has enough students this year to hire you for maintenance at all.” she said as she turned down the oven. After Aaron left for the rest of the day Jessica took the hot jars of stew out of the canner and ladled the next batch into jars and lidding them placed them into the large canning pot. After the canner lid was locked on tight she waited for it to come to a boil before she set the timer. On her way back down the stairs from collecting laundry from the bathroom hamper she heard a news story about two missing 14 year old children and she stopped and shivered on the steps. Jessica listened to her younger children giggle over a game they were playing and sighed. She tossed the laundry down to the bottom of the steps and went back upstairs to see her babies. There were winners and losers, strong and weak, and Jessica was going to have strong winners for children if she could do anything about it. Jessica approached the opened door and before going in listened for a few more minutes. She knew once they saw her she would have to play with them for at least a half an hour. Andy was teaching Cheyenne how to pretend to be a better dog. Jessica stepped back and went back down stairs to check on the canner. In ten minutes it would be done. She grabbed the laundry and put a load into the washer. The timer bell rang as she was closing the lid of the washer. Good timing. She shut off the canner and left it to cool. Back upstairs she colored with the children for almost an hour telling them tales about children becoming strong leaders when they grew up before she left them to play without her again. More stew needed to be canned. The older two came in the door after school and dropped their books on the kitchen chairs. Dallas took his books into the living room and turned on the TV. Crystal got the jar of peanut butter out of the refrigerator, a knife and spoon, and three of the apples out the fruit bowl and followed him. The little ones were scrambling down the steps to get their snack too. At the coffee table Dallas cut the apples and Crystal added the peanut butter to the snacks. Jessica brought in some paper towel squares and handed one to each of them and went back to stirring the stew pot as the gravy thickened. When Aaron came home from work the table had been cleaned off and then set for supper. The casserole smelled delicious but he didn’t head to the sink to wash his hands like he usually did. That was the signal for the kids to come to the table. In fact he had his hands behind him and stood in the living room doorway. The kids jumped up and swarmed around him all talking at once and wanting to know what it was he had behind his back. It was sugar. A five pound bag of sugar! Something the kids hadn’t had any of for weeks. The children cheered and rushed for their places at the table. The casserole was eaten in record time and the sweetened milk disappeared to the last drop. Aaron bathed the little ones while Jessica helped the older ones with the rest of their homework as she did the dishes. The older ones took their bathes and it was Aaron’s turn to read to them before bed. Jessica finished labeling the last batch of stew that she had made that afternoon. Jessica smiled and pushed Aaron back onto his side of the couch. “Let me think about it while we watch TV.” They watched other people make fools of themselves trying to win some money just to get by for a while. Up in the bedroom Aaron was lighting candles and Jessica was freshening up in the bathroom. She sprayed a light sprits of perfume on the pillows and got out the box of adult toys from under the bed while Aaron had his turn in the bath. Jessica had just moved the radio into the bedroom when Aaron came in with his hair still dripping. He hugged her from behind as she found a station with some soothing music. She turned around in his arms and they made their way to the bed. A year later Jessica was walking with the baby Roxanne and tot Sheyenne going to the school to collect her older children along with a few of the other parents. Mrs. Anderson was asking for recipes for some of the vegetables in her garden and wondering how Jessica’s children seemed in much better health them the rest. Jessica told them that now that they had their own kitchen gardens they needed to feed the soil compost and about poor soil verses rich. She also told them about how she feeds her garden with everything that she can including dead vermin and road kill that she bakes first to kill the germs. That explained the bad odors that sometimes came from Jessica’s house. And how nothing went to waste in her kitchen. She also told them she was available to help out in teaching them how to use a canner or food dryer so they could have good home grown food for later use. Aaron was working harder then ever. There was now a tax on children and he had five to keep in clothing and shoes. Thank the heavens above that they were health. When the health worker came around to check on all the neighborhood children six months ago they had a lot of questions and if it were not for the large garden thriving out back behind the high fence and his stories about hunting and fishing, he was afraid that the authorities would find out about Tony’s sugar and flour stash and that they would have cut Aaron off from the extra food. No one but he and Jessica knew about the storage bunker he had built under the house to hide their extra food in. And time marched on. Dallas was graduating from high school as valedictorian of the class. He was the strongest and brightest child in his class. Jessica was sure he would go far and she was just bursting with pride. The authorities wanted to take him and do genetic testing on him looking for breakthroughs in health science but Aaron and Jessica were against it. They kept their children close and wanted Dallas to start working on his further education in his career as a lawyer. They got him a job in a working law office. They didn’t want anything to derail their plans even for a short time. When Dallas wanted to move out of the house Jessica was in tears. “How can I keep you healthy if you are out on your own.” she sobbed. But he didn’t listen and moved in with a few of his friends. His health was not doing well at all a year later when he had to drop some classes do to illness. Jessica and Aaron finally convinced him to return home and he thrived once again despite the fact that Aaron was having a harder time of getting meat in the house and fishing was banned because of pollutants a few years ago. The meat to vegetable ratio was getting thinner. Jessica was even thinning out the older richer stew before serving it. And with Dallas planning to move back out again as soon as he was doing better again, Jessica was beside herself. But Jessica’s children were almost all grown and soon they would have to be informed as to what exactly she and Aaron had been doing to keep their children healthy all these years. How Aaron would hunt the healthiest children at the schools he was working for, luring them away from the others and killing them for the food that Jessica prepared for her children. Aaron would then fire the larger bones in a kiln at the college to be able to crush them and bury them under bushes and in the landscaping at the schools. It had worked all these years but to keep their children healthy when they left to live on their own they would have to be told what they needed to do for themselves. It was time to tell them how to butcher, and what was in the Trouble Stew. Please do not use, copy or reprint my photos or stories in whole or part without written permission thank you. I like Victorian, Edwardian & Gothic things. I'm a middle aged elder Goth woman. I have opinions. I have a husband (Mountain Man) and two grown children, (Thou my son died.) There are now two grandchildren. I also have a dog and a cat. Blogs of other writers and readers. RavensBlight - Stories, Toys, Art and more.